For over 20 years Compagnie du Ponant has lead the way in luxury yacht cruises, offering passengers a unique experience that is personalised to each individual. With a limited number of passengers, comfortable cabins and convivial public areas, Compagnie du Ponant guarantees a relaxed, intimate atmosphere unique to all their cruises. 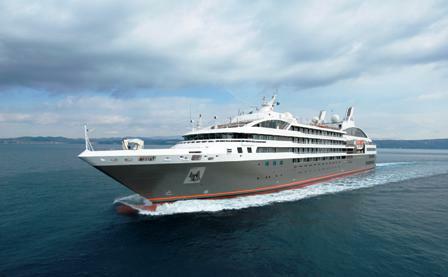 To celebrate Bastille Day on the 14th of July, Compagnie du Ponant is offering every passenger who books during the week of 11-15 July 2011 a shipboard credit of EU$150. And to add to the festive spirit, the French Cruise Line is also reducing fares on Asian and South American cruises by 5% on bookings made between now and the 15th of July. Compagnie du Ponant offers cruises worldwide with a fleet of five intimate luxury yachts and a true French spirit. Passengers who take up this exciting offer will discover golden shores inaccessible to most large ships, and experience Compagnie du Ponant's unique blend of private yacht intimacy with exciting bespoke itineraries. With 13 Asian itineraries on offer, passengers will have the choice to travel on Le Diamant to destinations that are exotic and memorable. Visit the bustling streets of Mumbai, with its rich diversity of geography and culture, or see the intricate décor of Vietnam. Explore China's colourful cuisine or Hong Kong's city of lights as you sail on Le Diamant with her113 cabins, 226 passengers and 120 crew members. Le Diamant offers private balconies and panoramic sea views from most cabins which create a unique European atmosphere and warm ambience. This limited offer also covers exceptional itineraries within South America travelling on one of the latest vessels, Le Boréal. South America is a sort after destination and will amaze you with the diversity of its immerse landscapes; waterfalls, arid deserts, volcanoes, tropical forests and a truly extraordinary flora and fauna. Passengers have the choice of cruising from Venezuela to Lima in Peru or Ushuaia in Argentina. For those interested in exploring Chile, Le Boréal will travel from Valparaiso to Ushuaia in Argentina. Le Diamant - 4th December 2011 - Hong Kong – Ho Chi Minh - $3, 241pp twin share incl. taxes. Le Boreal - 11th November 2011 - Valparaiso – Ushuaia - Superior Stateroom $5,264 pp twin share incl. taxes. Note: In order to take up this offer, passengers must secure their cruise by the 15th of July.